As a young woman growing up in the third century, Rachel Gallus has access to all the attractions and excess Rome has to offer: the games at the Coliseum, vivacious friends, and slaves to attend to her every whim. Yet questions haunt her thoughts—questions of human justice, of purpose in life, and of her own identity. After viewing a particularly striking martyrdom in the Coliseum, Rachel finds herself in a surprising set of circumstances, bringing her face to face with her own gripping desires and deepest sorrows. 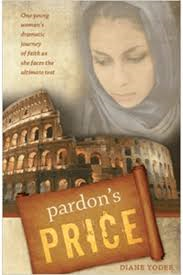 As she learns about the faith of the Christians, she is astonished at the price they pay for their beliefs. But she cannot forget what she has seen and heard. Join Rachel as she battles tenaciously through her anger, questions, and fears until she can accept pardon's price.